It was not long ago, a few decades really that Utah wolves were spoken of in the past tense. There were not any. Prior to this, from 1917 through 1930, 162 were taken. With 48 of these in 1918 alone. Only two were taken after 1926, though. But many Utahns were recently startled by a story from the Salt Lake Tribune… on September 25, 2010… of the sighting of as many as 15 wolves so far this year in the state. And not just running solo. Well, it is apparent that although Utah has not taken part in these efforts, the wolves don’t recognize state borders. The natural migration of wolves from Canada into the northwestern Rocky Mountains of Montana over the years has resulted in many packs regaining a foothold there. Canadian wolves… 31 of them… were introduced into Yellowstone National Park in 1995 and 1996. And 35 of them were introduced into central Idaho. A very controversial decision. In 2002, those numbers reached 261 in Idaho and 218 in the Yellowstone area. But a radio-collared wolf was captured in northern Utah in 2002. And there were other sightings of what were believed to be wolves in the state too. Under Utah state legislation, if there are wolves in the country, they are protected. And since 2003, there have been increasing reports of wolf activity in Utah. Last year… in 2009… there were nine reports throughout the state. But this year… 2010… there have been 15. And it’s still September. As you might expect, all this activity is rather naturally making people excited. And nervous. Because these reports have increased, so have the reports of livestock predation. And now, legislation has been introduced by two Utah congressmen to delist the gray wolf as an endangered species. Once again, in a confrontation between national courts and western private landowners, a recent federal court decision came down against the landowners. It ruled that the U.S. 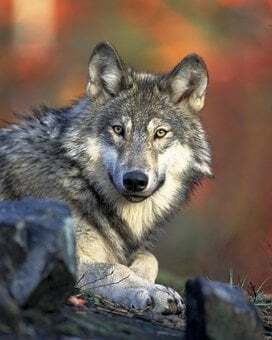 Fish and Wildlife Service didn’t have the ability to remove wolves from the endangered species list on a state-by-state basis. It had done so in Idaho and Montana to allow hunts in those countries as wolf populations continue to climb. Although not all reports of Utah wolves have been substantiated, the DWR… Division of Wildlife Resources… will acknowledge that it is clear that roaming wolves have wandered into the state from Idaho and Wyoming. But they say there is no evidence of packs or breeding. Every sighting had been solo. The majority of the confirmed sightings this season have been in counties bordering Idaho and Wyoming. And two wolves were killed this year after attacking Utah livestock in these areas. The Salt Lake Tribune article reports that on July 12, in the Uinta Mountains, someone reported seeing four wolves on the north side of Lily Lake just off the Mirror Lake Highway. The DWR says they don’t know if they were wolves or coyotes. Then, not long after that, a University of Utah environmental studies graduate was camping at Washington Lake just west of the above Lily Lake. He promised to have experience around coyotes and wild dogs. And he has heard wolves in the wild. He heard howling and shorter yelps which he is convinced was being made by a group of wolves. He and his companion made enough noise that the”wolves” became silent and moved away. State biologists have not followed up on these reports. On a personal note, it wasn’t too long after that my family and I spent the afternoon and evening at the same Washington Lake. Fishing. And hanging out in a campsite. However, these reports became public quite a little later so we weren’t aware of these”sightings”. Two things are apparent. And say biologists… at least openly… don’t seem to be in any rush to investigate their birth.